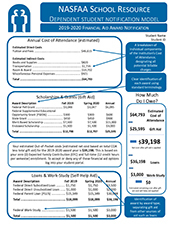 In recent years, policymakers have taken a closer look at financial aid award notifications. The National Association of Student Financial Aid Administrators (NASFAA) also values the importance of clear, concise, accurate information for students and parents, and recognizes there are ways to improve award letters. Over the past few years, NASFAA has continued work to improve award notifications, including a member-led task force, consumer testing, and updates to NASFAA’s Code of Conduct. September 2018 - Financial aid award notifications are the primary tool colleges & universities use to communicate eligibility for federal, state, & institutional financial aid programs to their prospective & current students. September 2018 - These award notification examples are intended to serve as samples for institutions about how they could implement the elements included in NASFAA’s Code of Conduct into their financial aid offers. September 2018 - Award notifications have come under scrutiny for a lack of clarity and for causing students to misunderstand the financial aid packages they are being offered. February 2018 - This tool helps students and parents compare financial aid award letters from different schools. 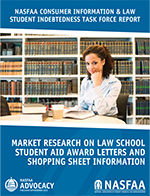 September 2016 - In their second report, NASFAA's Consumer Information and Law Student Indebtedness (CILSI) Task Force set out to identify through consumer testing what information on the financial aid award letter and ED’s Shopping Sheet could be modified to create a document that better assists students applying to, or currently attending, law school. March 2014 - The Glossary of Terms for Award Notifications was recommended in 2012 by NASFAA's Award Notification Task Force. It contains universally accepted definitions of language typically contained on award notifications given to current and prospective students. 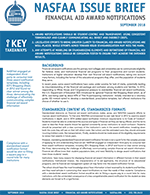 February 2013 - This study tried to ascertain how consumers (students and parents) would understand the information on a model or standardized award letter notification. Three types of award letters were tested, and no clear winner was found among the three. May 2012 - The Award Notification & Consumer Information Task Force was charged with examining best practices in award notification and consumer information and reporting back to the NASFAA Board of Directors with recommendations on how to improve or standardize elements of an award notification.